What makes a Coworking space great? Today I saw a very happy post by CoLab Orlando for getting mentioned on a blog for entrepreneurs. The blog had named Orlando a top city to start a company, and this was a follow-up list of Coworking movements in those top cities. 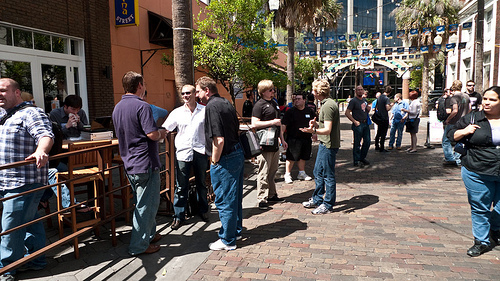 Orlando squeaked by with a grand total of one space describing their offering as coworking. Of course while bootstrapping a business every entrepreneur is looking for ways to keep what little money they do have but build an empire at the same time. Coworking is a relatively new option for business owners when it comes to getting office space. If you don’t already know coworking centers are places that allow you to rent a desk, office, or simply come to hangout in an open room with other business owners doing the same thing. The centers will offer wifi, coffee, comfortable furniture, printing and of course an innovative setting. You have to signup for one of their packages that could range from $10 for a day pass to a few hundred dollars to rent your own desk for the month and a variety of options in between. Whatever you do it becomes a cheaper and often more comfortable and innovative setting then renting your own private office space. Very nice, I can save some money. I was glad to see the list of spaces so long - 53 spaces in 10 cities - but I was not very happy at their coworking sales pitch. Edit: Plus there is a picture of a bunch of folks at a Jelly working in someone's living room (I assume JellyNYC). That's fine. There was even a token female in the picture. I was not too sure this screamed "entrepreneurship". Your description of Coworking is abysmal. It does not lend any help to differentiating Coworking from a shared desk, pay-as-you-go office environment. One of the most important things about a great coworking space is the safe atmosphere it creates for collaboration and mentoring. At a coffee shop, I can't turn to the person next to me and ask their opinion on something, or brainstorm an idea for my project - they would look at me funny. At many shared desk environments, it's dog-eat-dog, and if two people are in the same business, they'd be in direct competition, and likely stealing clients from each other. Since the coworking space is more collegial, you can share that project with your potential competition, or hand it to him when you get to busy, and he might be inclined to hand the next one to you. Also, the vibe of a great coworking space is hard to match, even at most places that use the term "Co-Working" somewhere in their sales pitch. The collected energy, passion, and raw talent is often dripping from the walls. There are many spaces where people are not just getting started, they're putting down roots. Since I'm involved in creating a space with Coworking elements right now, I feel like I am a bit more touchy about this subject than otherwise. P.S. If you haven't taken the Urban Re-Think Survey yet, I'd love it if you did. It would really help us out. ...and I just had to read it and leave my two cents. There was a comment by Colleen B, the local community manager for Yelp. Then there was a comment by Neon F, whom I know to be Neon Forest, a new art gallery opening up down the street from me next week. Ouch. One of my pet peeves is people who say "hey, let's start something huge and complicated!" It's one reason why I tread lightly before agreeing to work with a startup company, and why many of the emails I'm sent about building some crazy website go into the Archive bin pretty quickly. I think there are enough nascent efforts that just need some support and people to shout about them in bullhorns. Before I go on, I want to say I'm very glad you're opening a gallery in this neighborhood. The Orange/Michigan/SoDo/Conway area really needs some more culture and nightlife. I think one problem our scene has is that people decide to start something new without really taking the time to become involved with all the other events that are out there. The problem with starting YET ANOTHER new thing is that in order for these large events to be successful, they require more than one person to be involved. A micro-scene. At this point, so many people have started their own scenes, they are all spread too thin. The only way to make sure people aren't spread too thin, without any of these events dying off, is to add new people into the system. One great way to get new people involved is by having events that are so large and well-established that the word of mouth brings in all kinds of new people, particularly the haters and out-of-towners Colleen mentioned in her original post. ::phew:: Sorry about that. I think you hit on a sore spot. I'm really looking forward to coming to your gallery. I'll be out of town for the opening, but I'm not far away. I am pretty close by. I would just really like if there were fewer people saying "I'm starting" or "I just started" or "can you help me with"; I'd rather hear "we've been doing" or "can you give us some help with?". It's not to say I've never wanted to start something new, or big, or complicated, or naive, but I just hope my comments can make more than a few people pause and think about exactly what it is they're committing to. In the past few months, Downtown Orlando and Thornton Park lost a great gem - the one independent bookstore within miles of town. The Urban Think! Bookstore was a community-minded, education-focused, welcoming, original, and fun place to be. The many iterations of the store over the years, including the kids bookstore, the cafe, and even local vendors selling baked goods, handmade items, and other local goodies made it an exemplary space for other local businesses to emulate. In March, Urban Think! closed its doors after 8 years. A few years ago, their education and children's programs spawned the Urban Think! Foundation and Page 15, their first project. Now a new project is beginning, dubbed Urban Re-Think for now. I have been involved with several preliminary meetings with Julia young, the executive director of Page 15, and Darren McDaniel, the former Programming Director for the Downtown Media Arts Center. There are many other people involved, such as the Urban Think! Foundation's Board of Directors, and Katie Ball, local pot-stirrer, and star of public radio. I'm sure the list will grow beyond blog-post length before long. Right now, we have reached a point where we want to reach out to you, the Orlando community, and find out what you'd like to get out of a community center in the heart of Downtown. There are lots of benefits to the location and the involvement of the people who have been brought in so far, and it can only get better. For myself, I'm looking to gain a place to work, hold meetings, events, provide training, meet my creative peers and role-models, and continue to support the community in any way I can. If we had a clubhouse, a place where we could feel safe, and where we had control, I think we could build something really amazing. I've got all kinds of fun ideas, but before this becomes Ryan's own personal Urban Think!, I'd like to point you to our survey. Please check it out, and take a few minutes to tell us about you, your creative pursuits, and how this community center might help you reach your goals, and take away a few of the road blocks we all face. In his talk, Simon covers a concept about Starting with Why? - and he mentions "Crossing the Chasm", which is something that comes up often in the Drupal community. We say we can cross the chasm with training, or documentation, and I think those are good things to dial up. Ultimately, the members of the Drupal community have the "why" down, it's just a matter of showing the rest of the world. Back at BarCampOrlando this year, I gave a (mostly finished) version of this presentation, about the fall of the local bookstore, and a strategy for saving such establishments. As BarCamp is filled with programmers, I then tried to give them a relevant example: how to make your app better. (read: website, product, video, etc.) My argument is to focus on storytelling, and think like a Boutique. Credit goes to Tara Hunt for the idea of boutique stores. This is also related to a post about bookstores on this blog. View more presentations from Ryan Price. Thanks to Jim, Hewie, and all the other photographers for all the great pictures. Had a great meetup last night. I've left some audio notes here. The original meetup post and facebook event are around, but I took some great notes during the New Media Producers meetup using iEtherPad. This blog post is audio. Essentially, I wonder if our skills of storytelling will go away if we're able to link to everything. Instead of "you should have been there", will it be more like "I've got to find this link for you". While I haven't ever read Made to Stick: Why Some Ideas Survive and Others Die , I recognize the book as a brand around the idea of these "sticky" concepts. Here is a neat video re-posted from Fast Company with one of the authors of Made to Stick. How do you get people to believe your ideas? Well, there’s something we can learn from really sleazy ideas that catch on. For years, Snapple struggled to fight rumors that it supported the KKK. These sorts of things go over very well in conversations at bars, and they challenge our knowledge of trivia. For example, someone recently claimed to me that Ghirardeli Chocolate was owned by Kraft. Before the rise of internet-connected phones, I would take their word for it and try to remember to look it up later. However, even if I didn't, I'd probably still spread that meme until I could prove otherwise. Now, every bet can be settled with Wikipedia and IMDB on your phone - particularly if these sites were to provide an off-line version of their database. I know there are several ways to get Wikipedia's English database onto smartphones, even if it takes up a few gigabytes of space. What will be the next behavior that is outmoded by the wide availability of inexpensive portable internet-connected devices? Maybe my friends and family will stop calling me because they're pretty sure I'm "In front of my computer". My response could be: "Of course I am, I picked up my phone!" I promised some folks from BarCamp I would link to my blog post where I talked about saving local bookstores. I will post some slides soon, but I want to include the bullet points (i.e. actually finish the slides) before they get posted to SlideShare. Also, if anyone out there is looking for the mailing list for New Media Orlando, jump on there and join the discussion. I'm having a day of nostalgia. I was fiddling with a few things over on the Liberatr site (which seems totally redundant now) when I decided to sample a few of the early episodes of You Can't Spell Crapface Without PFA. I was having such a great time, I listened to one of the shows all the way through, and laughed the whole time! It's probably just the fact that I was there, but by the end of the show I was thoroughly convinced that Emily, Gina, Mumpsy, Marc, Nicole and the rest of us should start doing these talk shows again, if only for an excuse to have a weekly conversation. Crapface 09 - That was like ESPN! I'll admit I have a lot of fun recording and keeping up with the DrupalEasy Podcast, but our goals are SO different from that of a laid-back, wine-induced, pop culture free-play verbal romp. I'm now trying to get a group of people excited about producing local independent media so we can publish it on Orlando Scene TV, but the goals and the tone there will be equally different from DrupalEasy or Crapface. I miss sitting on the couch and broadcasting to 3 people. Let's bring it back.